Stop the engine. Set the parking brake and shift the shift lever to P (vehicles with an automatic transmission) or N (vehicles with a manual transmission). Remove the mud, snow or sand from around the stuck tire. Place wood, stones or some other material under the tires to help provide traction. Shift the shift lever to the D or R position (vehicles with an automatic transmission) or 1 or R position (vehicles with a manual transmission) and carefully apply the accelerator to free the vehicle. When your vehicle becomes stuck and cannot move, the emergency hook is used for another vehicle to pull your vehicle out in an emergency. Your vehicle is not designed to tow another vehicle. If you choose to push the vehicle back and forth to free it, make sure the surrounding area is clear to avoid striking other vehicles, objects or people. The vehicle may also lunge forward or lunge back suddenly as it becomes free. Use extreme caution. Be careful not to shift the shift lever with the accelerator pedal depressed. This may lead to unexpected rapid acceleration of the vehicle that may cause an accident resulting in death or serious injury. ●Avoid spinning the wheels and depressing the accelerator pedal more than necessary. 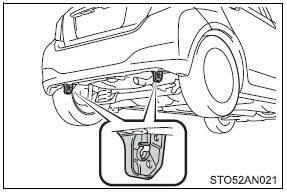 ●If the vehicle remains stuck even after these procedures are performed, the vehicle may require towing to be freed.